Merry Christmas from the Millennial Homemakers! This year, we’re celebrating by bringing you the Twelve Days of Christmas. 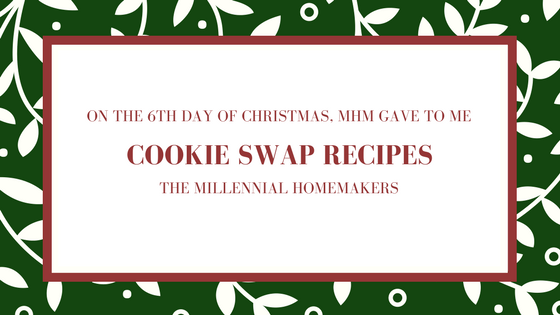 On the sixth day of Christmas, the Millennial Homemakers give to you - Cookie Swap Recipes! We’ll share some of our favorite cookie recipes to make for cookie swaps. Bring heavy whipping cream to boil. Take off heat and add chocolate chips. Let sit for about 5 minutes, then stir until smooth. Add chocolate chips and heavy whipping cream to cookies and stir. Roll into small (1 inch or so) balls and refrigerate for 1 hour. Roll in sugar, cocoa powder, walnuts, or topping of your choice. Cream butter, then add sugar. Mix egg, milk, and vanilla. Add in chocolate chips. Press dough through a cookie press. Mix cake mix, cool whip, and egg. Roll mix into small balls. Split the sugar cookie dough into three parts. Mix in red food coloring to one part, green food coloring to another part, and leave the last part white. Press all 3 parts together. Roll out dough and cut into your favorite holiday shapes. Cook cookies according to the directions on the mix and remove from oven. Before the cookies are cooled, press a small indent in the center of each cookie. Add a Hershey kiss to each crater. Mix flour, baking soda, salt, cinnamon, cloves, and ginger. Add sugar to shortening. Mix in egg and molasses. Add the two mixes together. Shape into balls and dip in powdered sugar.